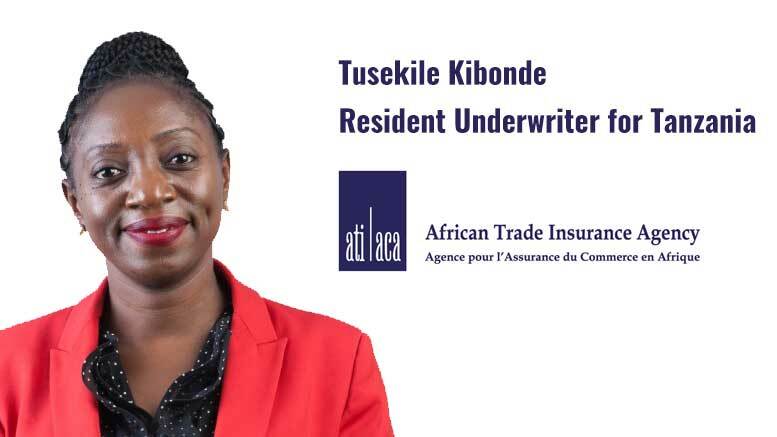 TanzaniaInvest had the pleasure of interviewing Tusekile Kibonde, Resident Underwriter for Tanzania at the African Trade Insurance Agency (ATI). Ms Kibonde discusses ATI’s current performance and development strategies, as well as the investment opportunities available in Tanzania. The African Trade Insurance Agency (ATI) is Africa’s export credit agency, providing political risk and trade credit risk insurance products with the objective of reducing the business risk and cost of doing business in Africa. The company’s main goal is to help increase investments into its African member countries and two-way trade flows between Africa and the world. ATI was formed in 2001. It is owned by African countries; this makes ATI a multilateral institution. ATI currently operate in Benin, Burundi, Democratic Republic of Congo, Kenya, Madagascar, Malawi, Rwanda, Tanzania, Uganda and Zambia. Ethiopia, Ivory Coast and Zimbabwe are at an advanced stage of completing their membership into ATI. TanzaniaInvest: What is the rationale behind establishing ATI? Why do you cover the countries you cover? Tusekile Kibonde (TK): In 2001, the World Bank with the support of COMESA conducted a study, which indicated that foreign investors perceived Africa to be a risky continent. ATI was then established to cover the risks to investors. Here we help our member countries, such as Tanzania, to attract investors. We protect their investments against any unfair action by any of our African member governments. The other objective is to boost trade between countries. Developed countries have national institutions that serve the same function as ATI. The size of most African economies however, was seen as too small to justify the formation of individual companies. So, ATI was created to fill this role for all African countries. At the time of inception, there were 7 founding member countries in ATI, including Tanzania. More countries eventually joined including the latest newcomers that are in the process of joining by the end of this year . ATI will potentially be able to operate in 13 African countries. TI: What have been ATI’s achievements so far at group level and in Tanzania? TK: ATI has been growing over the past years in both business volumes and reputation. Since 2008, we have been an A-rated institution by Standard and Poor’s (S&P). This is significant because our investment-grade rating is higher than that of our member countries, which enables us to step in and provide security on their transactions in place of their government guarantees. In the past 5 years we went from a loss making to a profitable position. In 2014 we posted US$ 3.5 million in profits representing a 120% increase over 2013. For 2015, we are expecting to post a 27% increase in profits. This growth signals that our products are becoming better understood and known in the market, where the uptake is coming from local and international companies and investors. Our products are in demand. Prospective member countries are seeing the value of our presence which is reflected in the increased level of interest from new countries. Our visibility is also picking up across Africa and internationally. We have developed a reputation with international markets as a trusted partner. This has helped to bring financial support to many projects. In Tanzania, ATI has been an instrumental partner in helping to unlock the flow of financing for private companies and for state-run agencies in some key sectors. These include energy, telecommunication, financial services etc. We help financial institutions lend safely to more customers by protecting them against payment default risks from their borrowers. This same cover has also been applied to companies that wish to expand their business into new markets or wish to purchase goods or services for their companies. In Tanzania, we have facilitated more than US$2 billion worth of investment and trading activities into the country in the past 5 years. We continued to support our Governments by offering an alternative solution to guarantees. This support has helped member Governments relieve the state debt burden, freeing up financing for infrastructure and power projects within ATI’s markets. TI: Whom do you compete with? TK: It’s important to understand that this business is not really about competition. It’s really based on partnerships because typically it helps to spread the risk, particularly on large transactions. In the case of ATI, we add value to our partners due to our existing relationships with member governments. This helps in case any claims arise. We can often fall back on this relationship to find an amicable solution. For our partners this is an invaluable asset. TI: What is your relation with banks that provide trade credit and trade finance? TK: Banks represent over 70% of our client base. They come to us for backup so they can lend safely to more customers. ATI does this by offering banks protection against payment default risks from their borrowers. Small companies have benefited from this cover. They often find it difficult to access bank financing because they are seen as a high risk. ATI has developed a number of products to make it easier for banks to finance these prospective clients. We work a lot with financial institutions because they provide an effective channel for us to reach more companies with our products. In order for us to issue cover, we need to analyse the entire transaction as well as the client we want to take a risk on and be comfortable with the risk we want to take. In this area, we have seen our visibility rapidly expand in Tanzania. At this point, even some of the banks’ clients will introduce our products to the banks themselves. We have seen a number of deals brought to us due to reference by others who have used our products before. TI: What makes you stand apart from other insurance companies? TK: We do not fall in the same category as other insurance companies. Our mandate is much broader. We are here to partner with investors, companies and the government themselves to help bring in more investments and improve the business environment. Tanzania is a founding member precisely for this reason. For local insurers, we provide added capacity and help them diversify their business. We are a trusted partner for many, including insurers. In many of our member countries we have increased the insurance industry’s ability to adequately insure against political violence, terrorism & sabotage, and also for bond products. So, I suppose, we are unique in this aspect because we do not compete with domestic insurance companies. TI: Brokers have a leading role in generating business for insurances companies in Tanzania. What is your relation with brokers? TK: Historically, brokers have found it difficult to understand and to refer our products successfully, mainly because our products are specialised. This is changing. We are now seeing more business generated from brokers, particularly international brokers. We have a program to encourage brokers to partner with us. They can become registered brokers for ATI so that they are better remunerated for bringing business to us. To become a registered broker for ATI, they must provide details including a copy of their business registration, a company profile and their audited financial statements for at least the past 3 years. We can also register newly set-up brokerage companies. Once submitted, we assess the documents and if approved, we issue a letter confirming the broker’s registration status. All ATI registered brokers appear on our website. This visibility acts as a marketing tool for brokers because inclusion as an ATI broker means they have been vetted by an A rated international company. Brokers also benefit by receiving a fee for referring business that is translated into an actual policy. As an ATI registered broker, you can go out in the market and educate your client about our products. I’m willing to support them in providing information to their clients. So, whenever there is a potential client, brokers in Tanzania are free to set up a meeting with me to help them understand our products. In Tanzania, we have a number of brokers who are very active in introducing our products to their portfolio of clients. As a result of bringing business to us, they have benefitted from this programme. TI: And which relation do you have with insurance companies? TK: ATI enhances the capacity of local insurance companies. Specifically, we help insurers issue to their clients, political violence, terrorism & sabotage cover and also bond products. Typically, most local insurers do not have the capacity to be able to provide this cover. An agreement with ATI, allows insurers to enhance their capacity and, as a result, their ability to issue a facility to their client. For example, a local insurance company may have capacity to issue a bond facility of up to say US$2 million. If they receive an enquiry for say US$7 million, this becomes a challenge. Their option will be to team up with a number of other insurance companies and come up with the total facility of US$7 million. This may take longer or may force their client to source other options such as banks. Partnering with ATI means, upon a successful review of the proposed transaction, we are able to offer a facility for the entire balance. ATI helps insurers reduce documentation, retain clients on their books and to offer a facility without the client ever knowing that ATI has provided the extra support. TI: To conclude, if there was one thing you would like the prospective clients to understand about ATI, what would that be? TK: ATI’s products cover key sectors such as energy, manufacturing, telecommunications, financial services, construction and transportation, just to mention a few. Our products are here to serve both corporates and SMEs. And we are also here to serve the government’s needs. In fact, for some projects such as infrastructure and power, our products are used as an alternative to sovereign guarantees. To access our services and products, one leg of a transaction should be within a member state. For example, let’s take a Tanzanian tea exporter that wants to explore a new international market. The Tanzanian tea exporter may hesitate to explore this new market because the credibility of their international buyer is unknown to them. ATI’s credit insurance cover will help the Tanzanian exporter explore this new market with ease because the exporter can then pass on the credit risk to ATI. These products are known in the developed world, where most payment terms are on credit. We are here to help businesses grow and to explore international markets. In this way, we also help companies to compete on an equal footing with companies outside of Tanzania. We are not here to change the viability of projects but we are here to strengthen the viability of projects.